You are currently viewing archive for March 2009. Brett Gardner has won the starting center field job, beating out Melky Cabrera, reports Bryan Hoch of MLB.com. Gardner hit .385 (20-for-52) with three home runs, six RBIs and five stolen bases in 22 spring games for the Yankees, impressing the coaching staff by continuing to showcase plus speed in the outfield and on the bases. The 24-year-old Cabrera skipped an opportunity to play in the World Baseball Classic in hopes of securing a job, putting up a good fight. Through 21 spring games, Cabrera batted .340 (18-for-53) with one home run, nine RBIs and two stolen bases. Cabrera, who is out of options and would have to be placed on waivers before any demotion, is expected to make the team. Bryan Hoch of MLB.com says that the Padres have shipped pitcher Ivan Nova back to the Yankees after Nova failed to catch on with San Diego, who selected him in the Rule 5 draft in December. He's headed to Double-A Trenton. When politicians questioned the propriety of the Yankees’ $1.2 billion in tax-exempt bonds for their new stadium, Randy Levine, the team’s president, scolded them for having their facts wrong or for failing to examine similar financing for the Mets’ Citi Field. When the Milwaukee Brewers’ owner criticized the Yankees for signing $423.5 million in free agents this off-season, Levine countered, as he frequently has: we follow the rules, so don’t tell us how to invest our money. In recent years, as George Steinbrenner has faded from view as the principal owner, Levine has emerged as the strongest voice of the Yankees, baseball’s wealthiest team. He is their executive-as-prosecutor, a tough, short-tempered and smart protector of the Steinbrenner family and the Yankees brand. In other news, Joe Girardi threw a change-up after the game, saying it was “possible” they could start the season without a long reliever. That means Jon Albaladejo could make the squad instead of Alfredo Aceves, Dan Giese or Brett Tomko. Steve Silva of the Boston Globe has some quotes from a WFAN interview with Mark Teixeira. In the interview, he says that he and his agent were clear, with any clubs interested in his services, that he would not negotiate through the media and asked that they also not do so. The Yankees "were really the only team that did that," according to the first baseman. Specifically, the article centers around the fact that the Red Sox didn't and Teixeira says that it helped to impact his decision. "... I think in the end, it probably worked against [the Red Sox] a little bit, because everyone thought the Red Sox were [my] No. 1, but in reality, the Yankees were gonna be the team, like I said all along, if all things were equal, the Yankees were the place that I wanted to go," Teixeira said. "It made the most sense for my family. It made the most sense for me and my career and where I wanted to go. Being a Yankee and wearing the pinstripes into the new Yankee Stadium, it doesn't get any better than that. They had a leg up all along." Jason Jones, the pitcher who was taken from the Yankees by the Twins in the Rule V draft and later said he didn't feel appreciated by the Yanks, will remain in Minnesota. ... Nolte had a 2.05 ERA with Low-A Beloit last season and a 1.85 ERA in the Gulf Coast League the year before. All told he's struck out 97 batters in 94.2 innings while walking 46 and holding opponents to a .230 batting average. His groundout-to-flyout ratio last year was better than 4.82-to-1. That's a huge groundball tendency. MLB.com's Bryan Hoch reports that Derek Jeter is day-to-day after injuring his pinky knuckle after a collision with Braves first baseman Greg Norton. Jeter remained in the game for a while before being pulled. Joe Girardi expects him to play Sunday. At first, I wasn't going to post this when I was e-mailed by Scott Blumenthal, the Yankees fan featured in the video. But, you know, I was entertained. Check it out. Their website is Nine More Outs. Update: Add John Rodriguez to this list. On his Twitter, MLB.com writer Bryan Hoch mentioned that the Yankees had reassigned Doug Bernier, Shelley Duncan, Justin Leone, Todd Linden, P.J. Pillittere, Dave Robertson and Chris Stewart to the Minor League camp. Kat O'Brien reports that Joe Girardi expects both Brett Gardner and Melky Cabrera to make the team, regardless of who wins the job in center. That's a decision that Girardi would like to have made by Sunday or Monday. From all indications, Gardner appears to be in the lead. Word is that the new Stadium is not particularly conducive to television cameras. The camera behind home plate, for instance, will have to shoot through the protective netting. Unlike the steeper old Stadium, there is no position to get a clean shot from that angle. I doubt this is going to be much of an issue... I'm sure they'll find a way. 03/27: Aaron Boone's Heart Surgery "Went Well"
"I spoke to Aaron's father, Bob, and he indicated that things went well," Houston general manager Ed Wade said. "Certainly our prayers are with Aaron and the entire Boone family in hopes of a full recovery." 03/27: Who's Playing in the 2009 Yankees Bloggers Fantasy Baseball League? For the third consecutive year, a number of Yankees bloggers all got together for a fantasy baseball league that drafted back on March 10. Playing this year are Dave and Aziz Nekoukar of Pride of the Yankees, Andrew Fletcher of Scott Proctor's Arm, Eric Schultz of Pending Pinstripes, Dan LaTorraca of Pinstripes, Pa., Greg Cohen of Sliding Into Home, Steve Schwartz of The Yankees: Minors to Majors and YankeeGM of Yankee GM Blog, along with Seamus and myself. I'll blog a bit about my team before the season. Good luck to everyone who is participating! Updating a previous story, Bob Sheppard's wife, Mary, told Newsday that it wasn't likely that he'd be on hand when the Yankees open their new stadium on April 16. The AP reports that CC Sabathia will pitch both the Yankees season opener on April 6 and the team's home opener on April 16. Girardi is also "toying" with the idea of flip-flopping leadoff hitter Johnny Damon and No. 2 hitter Derek Jeter in the batting order. The manager plans to have Jeter hit first and Damon second on a regular basis during the remaining spring training games. It is with deep sadness that the New York Yankees announce the passing of longtime baseball writer and executive Arthur Richman. He passed away peacefully in his sleep at his home in New York City early this morning with his wife, Martha Richman, and friends by his side. He was 83 years old. The Mirror folded in 1963, and Mr. Richman quickly took a position in the front office of the New York Mets, where he worked for 25 years. In 1989, Mr. Richman went to work for the Yankees, holding the positions of Senior Vice President and Senior Advisor in the club’s media relations department for nearly two decades. Services will be held on Thursday, March 26 at 11:45 a.m. at Riverside Memorial Chapel on 180 W. 76th Street in New York City. He is survived by his wife, Martha. Mr. Richman was predeceased by his brother Milton — an award winning sportswriter and editor for United Press International. The family asks that any memorial gifts be sent in Arthur’s name to the “Catch 25 Foundation,” established by New York Yankees Manager Joe Girardi. Donations will be dedicated specifically towards the area of the foundation that focuses on Alzheimer’s Disease research and support. For more information on the foundation, visit www.joegirardi.com. Donations can be sent to Catch 25 Foundation, 220 West Huron, Suite 2001, Chicago, IL, 60654. ... Williams says his fellow Yankees didn't always appreciate his musical stylings back in his major-league days. "I used to bring my guitar all the time on plane rides and the bus," he laughs. "I happened to sit behind or in front of Derek [Jeter]. He used to tell me to shut up. I'd drive him crazy! I would try to serenade him, but he would have none of it after a game. Everybody's sleeping, and I'm trying to play some blues right in his ear." The Yankees' message was, "Put all the distractions behind you.'' And Rodriguez agreed, according to people familiar with those discussions. River Ave. Blues' Ben Kabak links to a mailbag article by Bryan Hoch from March 19, where he talks about Bob Sheppard's status for opening day. Sheppard appeared recently on WFAN and said that he is feeling strong enough to return to work on April 3, having been brought "back up to good fighting weight." Sheppard checked into the hospital at 103 pounds, but told host Ed Randall that he now weighs 145 pounds. "The doctor said to me, 'When you get to 145 pounds, and you have adequate stamina, I'll allow you to go back to work,'" Sheppard said. "I'll be ready if God is willing, because I'm willing. He knows I'm willing." Let's hope. We wish Mr. Sheppard well. Before Tuesday's game against the Red Sox, Yankees manager Joe Girardi gave a fairly revealing glimpse into the race for the big league utility job. He said it's between veteran Angel Berroa and young shortstop Ramiro Pena. Berroa has been the better hitter this spring and has much more experience, but Pena's bat has come to life lately and he seems to be a much better defender and probably a better runner. Pena, who has not seen big league action, will be 24 in July. Berroa, the 31 year old veteran, hit .230 last year for the Dodgers and has hit .260 over his career, spanning 8 seasons and 711 games. Peter Abraham reports that three more players have been sent away from the Major League camp. They are Austin Jackson, Eduardo Nunez and Juan Miranda. Jackson had a nice spring, hitting .333 with a double, triple, 3 home runs and 10 RBI. Tickets for individual games to see the 26-time World Champion New York Yankees in the inaugural season at Yankee Stadium will go on sale today at 10:00 AM at www.yankees.com and www.yankeesbeisbol.com only. Beginning Wednesday, March 25, tickets may also be purchased at the Yankee Stadium Ticket Office, at all area Ticketmaster outlets, via Ticketmaster by phone at (877) 469-9849 and Ticketmaster TTY at (800) 943-4327, and at all Yankees Clubhouse Shops. As in past years, the Yankees will make available individual-game ticket value programs throughout the 2009 season. A complete list of ticket specials, including game dates, seating locations, and terms and conditions, can be found at www.yankees.com/ticketspecials, by calling (718) 293-6000 or e-mailing tickets@yankees.com. · $5 Games – For select games throughout the season, tickets in select areas of the Terrace and Grandstand Levels and Bleachers will be $5. Tickets for $5 Games may be purchased in advance or on the day of the game. Available games include: 4/20 vs. Oakland, 4/21 vs. Oakland, 5/7 vs. Tampa Bay, 5/20 vs. Baltimore, 6/3 vs. Texas, 6/17 vs. Washington, 7/2 vs. Seattle, 7/20 vs. Baltimore, 8/11 vs. Toronto, 8/27 vs. Texas, 9/15 vs. Toronto and 9/28 vs. Kansas City. · Youth Games – All fans 14 and younger, when accompanied by an adult, can purchase half-price tickets for Saturday games. Tickets are available only on the day of game at Yankee Stadium Ticket Windows. · Student Games – Students who present their valid high school or college ID cards when purchasing tickets for any Wednesday game can receive one half-price ticket in designated seating locations. Tickets are available only on the day of game at Yankee Stadium Ticket Windows. · Senior Citizen Games – Senior Citizens (60 and older) can purchase $5 tickets for any Monday through Thursday game in designated seating locations. Tickets may be purchased in advance or on the day of game at Yankee Stadium Ticket Windows ONLY. Tickets will not be held for either advance or day of game sales. All tickets are first come first served. A valid form of identification must be presented at the time of purchase. · Family Games – Families can enjoy specially priced tickets on designated Monday through Thursday games in April, May and September. Tickets may be purchased in advance or on the day of game. · Value Pack Games – For select games, groups of four fans can get a great deal at an affordable price. Each Value Pack includes four tickets, four hot dogs, four non-alcoholic beverages and one New York Yankees Official 2009 Yearbook. Tickets to the first two exhibition contests at Yankee Stadium vs. the Chicago Cubs on April 3 at 7:05 p.m. and April 4 at 1:05 p.m. will also go on sale on Tuesday, March 24 at 10:00 AM at www.yankees.com and www.yankeesbeisbol.com only and everywhere else on Wednesday, March 25. For the exhibition games vs. the Cubs, Bleachers tickets will be 25¢ and Grandstand tickets will be $1.10—the same prices they were the day the original Yankee Stadium opened on April 18, 1923. Tickets on the Terrace Level will cost between $20-35, tickets on the Main Level will be priced between $20-45, and tickets on the Field Level will range from $45-$50. The 26-time World Champion Yankees will begin their 81-game home regular season schedule on Thursday, April 16 at 1:05 p.m. vs. the Cleveland Indians. The Yankee Stadium Ticket Office is located outside the new Yankee Stadium adjacent to Gate 4 on 161st Street and Jerome Avenue. Beginning March 25, the Yankee Stadium Ticket Office will be open Monday through Saturday from 9:00 a.m. to 5:00 p.m. and Sundays from 10:00 a.m. to 4:00 p.m. The old Yankee Stadium will be chopped up and sold to fans in little pieces as part of a $10 million-plus deal the team struck with the city, The Post has learned. The payment will give the team the right to sell city-owned portions of the ballpark, including all 57,000 seats, the foul poles, dugouts and even the urinals sources familiar with the deal said. Any guesses on how much the seats will go for? It's unclear if Xavier Nady is just leading the race in right face, as Bryan Hoch says, if he's outright won the job, as Tyler Kepner says. But, regardless, he's at least in the favorable position and, if the season started now, it would be his job, Joe Girardi told Hoch. Swisher is quoted in both articles. "They wouldn't have brought me over here if I wasn't going to do something," Swisher said. "We're just going to see how it goes." “I’ve been thinking all day about what I wanted to say,” Swisher told us after the game, an 8-3 loss to the Phillies. “I’m the type of guy, I want to play every day, there’s no doubt about that. I guess we’re just going to see how it plays out. "I still had the same mind-set going in, to try and get ready for the season," Nady said. "I know Swisher is obviously going to be a big part of this team. We both plan on playing a lot, and I think we're going to need everybody in order to have success." Despite pitching 9 and 2/3 scoreless innings (against Major League teams) to begin the spring, Kei Igawa has been sent packing to the Minor League camp, reports MLB.com's Bryan Hoch. "I thought he did a really good job most of Spring Training," manager Joe Girardi said. "I thought this was probably his best." The Yankees have issued a press release announcing the dining options that will be available at the new Yankee Stadium. And there's a lot of them. John Branch of The New York Times reports that officially licensed New York Yankees grass (that's sod or seeds) will be available in Home Depot stores in the New York area toward the end of this month. They'll also be selling gift sized portions of seed at Yankee Stadium and elsewhere. 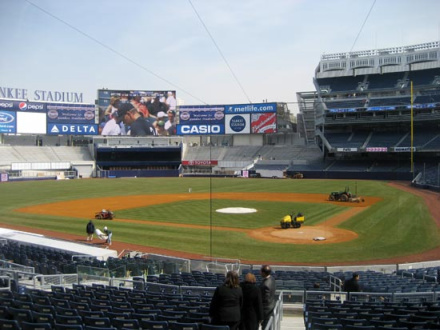 A former consultant with the company and now Mr. DeLea’s vice president for business development, Mr. Andres saw a field of bluegrass far bigger than the two and a half acres needed to cover the grassy portions of the new Yankee Stadium. The team had asked Mr. DeLea to reserve 10 acres for the stadium, apparently in case of some horrific horticultural incident in the Bronx, but that left a lot of leftover sod. Thank you to everyone who has participated. We'll be back with more blogger interviews next offseason. On Twitter, MLB.com's Bryan Hoch reported that the Yankees had acquired catcher Chris Stewart from the White Sox for "future considerations." Stewart played in one game for the Yankees last year, going 0 for 3. He's 27 and has played in 24 games total for the White Sox, Rangers and Yankees. Bryan Hoch reports that seven Yankees have been reassigned away from the Major League camp. They are pitchers Anthony Claggett, Phil Hughes, Steven Jackson, Humberto Sanchez, Sergio Mitre and Jason Johnson, as well as catcher Francisco Cervelli. 42 players remain. 03/22: A-Rod Dr.: A-Rod "Ahead of Schedule"
Dr. Marc Philippon, the doctor that performed A-Rod's hip surgery, told The New York Times that the third baseman was ahead of schedule on his rehab. Baseball Prospectus' Will Carroll said the same thing yesterday. “He already has better range of motion than he had before,” Philippon said. Ben Kabak at River Ave. Blues quotes Baseball Prospectus' Will Carroll in saying that A-Rod is "is 'well ahead' of his rehab schedule." No additional details were offered. But, good news is good news. Over at SportsForums.net, we've got a fantasy baseball league going. Seamus and myself are both participating, so I wanted to be sure to invite any YanksBlog.com visitors to join us. For full details, please check out the league announcement. The league is drafting on Sunday. Tyler Kepner shares the fun tale of how Jorge Posada garnered the nickname Sado. It seems that when Posada came into Game 2 of the 1995 division series as a pinch-runner, in just his second career game, Sheppard introduced him as “Jorge Po-Sah-Doh.” You have to hear Jeter do the imitation to get the full effect. If Mariano Rivera's health falters and he is unable to close, the likelihood is Joba Chamberlain would be switched into the role, multiple Yankees officials told The Post. ... if Rivera were to miss a sustained period, three club officials verified that Chamberlain almost certainly would replace him. The officials admitted the subject has been discussed at the highest levels and conceded Chamberlain has the best combination of temperament and stuff - by far - in the organization to handle both replacing the legendary Rivera and coping with the stress of being the Yankees' closer. Thankfully, Mo's right on track, so hopefully this is a bridge we will not have to cross. Yesterday evening we learned of the filing of a complaint against Mr. Bernie Williams. The news has taken us all by surprise. On the night in question, Mr. Williams had gone out after accepting an invitation to be a guest performer with a local music act. Mr. Williams denies any wrongdoing and we feel that some published media reports today are inaccurate. At this time, Mr. Williams has been advised by his legal counsel, José M. Marxuach, to not make any further comments, inasmuch as we do not want to interfere with the ongoing investigation. We want to assure everyone that Mr. Williams will fully cooperate with the local authorities to have this matter clarified as soon as possible. Aaron Boone, who is well known for hitting probably the most famous home run in the remodeled version of the old Yankee Stadium, has announced he will need open heart surgery in order to battle a condition that he's known about since college. According to Boone, doctors have told him he may resume playing after he recovers from surgery, but he is not sure whether he will or not. Aside from winning the 2003 A.L. pennant with a walk-off home run in the 11th inning against the Red Sox, Boone suffered a freak injury in the ensuing offseason, facilitating the trade that started the A-Rod saga in New York. Our best wishes go out to Boone and his family. Hopefully it all goes well. The Yankees (or NYC, not really sure who is in charge of this) have begun the process of gutting the field at the old Yankee Stadium. The WCBS 880 website has some photos. It's almost hard to believe it's real. Bob Ruffolo over at The Voice of Yankees Universe has some great new photos of the new ballpark in the Bronx as we move ever so much closer to Opening Day (Apr. 3 exhibition is just 18 days away). Thanks to Bob for the photos (I'm not sure if more padding is going on the walls, but I've noticed the outfield wall is a much darker shade of blue than the old ballpark). 03/15: Yanks Looking at Bobby Crosby? SI.com is citing a Boston Globe article that says the Yankees might have shown some interest in disgruntled A's infielder Bobby Crosby. Bobby Crosby has been playing some third after the A's traded for Cabrera, auditioning for a job. So far, he looks very stiff at third, and according to one scout, "You can tell he's resisting this with every bone in his body. He wants to play short, and that shows in his body language." The Yankees and Cubs have been watching, but neither has bitten. This is probably much ado about nothing if he isn't willing to play third, since that would be the only reason the Yankees would have any interest in him in the first place. That assertion could be wrong though if it turns out there is more to Robinson Cano's injury situation than meets the eye. You can click here for the online registration form. Update: Bernie's manager has issued a statement. An Associated Press report (via Newsday) is citing a complaint from a woman who says that Bernie Williams hit her in the face at a night club in San Juan, Puerto Rico. The woman alleges that Bernie broke her camera and then assaulted the woman as she was trying to take his picture. My reaction? Wow. I've learned over the years not to put anything past anybody in the sports and entertainment business (we don't know who these people are), but Bernie is one of the guys who I would put something like this past. Let's hope it's not true. Those making exactly $400,000 will be playing for the league minimum should they make it onto the major league roster. Chad Jennings has compiled a list of players who were not invited to the big league camp, just like Alfredo Aceves last year, yet could have a chance of contributing in the Majors this year. Worth checking out. MLB.com's Bryan Hoch reports on the likelihood of the Yankees going outside of the organization to find a stand in for A-Rod while he recovers from his recent surgery. "I'm not optimistic about doing anything," Brian Cashman told Hoch. "I'm not going to be proactive in trying to do something. If something presents itself that makes sense, which is not realistic, then maybe it will be somebody different. I think our answer is here in camp." On Monday, after Italy's win over Canada in the World Baseball Classic, team hitting coach Mike Piazza had some solid praise for Yankees prospect catcher Francisco Cervelli, who started for the club. There's more in Kepner's article. Kat O'Brien and Peter Abraham have word of the first cuts of the Spring, as J.B. Cox, George Kontos, Kanekoa Texiera, Andrew Brackman, Eric Hacker and Wilkin De La Rosa were all sent to Minor League camps. 03/09: Burnett and Girardi Organize "WBC Ryder Cup"
Mark Feinsand reports that A.J. Burnett pitched the idea of a "WBC Ryder Cup" to Joe Girardi and Girardi approved. Basically, using bats and balls, pitchers putted along the base paths, teaming up based upon the number of countries represented by the available players. They came up with 8, including "Native America," led by Joba Chamberlain. The countries were Chinese Taipei (Chien-Ming Wang), Cuba (Christian Garcia), Japan (Kei Igawa), Dominican Republic (Jose Veras), Puerto Rico (Jonathan Albaladejo), United States (A.J. Burnett), Mexico (Sergio Mitre) and “Native America” (Joba). The Chinese Taipei team of Chien-Ming Wang, Phil Hughes and Triple-A pitching coach Scott Aldred brought home the victory, earning themselves the right to do half the running that the rest of the pitchers did. Of course, Aldred's a coach and Wang's coming off an injury, so Feinsand notes that Hughes was the primary beneficiary. ... to be accurate, neither guy is doing the actual Twittering. They send text messages to their marketing rep, who sanitizes the Twitter posts for their protection. Yankees third baseman Alex Rodriguez underwent arthroscopic surgery Monday to repair torn cartilage in his right hip, and doctors said they found nothing that would keep him from returning to the lineup in May. "The surgery went exactly as we planned," said Dr. Marc Philippon, who performed the 80-minute procedure at Vail Valley Surgery Center in Colorado. "No surprises." Update: We have the last person. Thanks! Tomorrow, the Yankees Bloggers Fantasy Baseball League for 2009 is drafting. We are looking for one more player to give us an even number. So, I wanted to put up a last call. If you'd like to join, please e-mail me as soon as possible and I will get you the info. Thanks! Alex Rodriguez's decision to undergo surgery on his hip is fueling rumors that the Yankees are interested in Mark Teahen as a temporary replacement at third base. Royals officials, for now, are brushing off the speculation, and general manager Dayton Moore has long maintained that Teahen is more valuable now to the club than in previous years because of his versatility. It didn't take long, however, for Brian Cashman to squash that rumor. "I'll be honest with you; we have not had any discussions internally about that -- not myself daydreaming or my pro scouting director [Billy Eppler], though I know he's proactive, so I'm sure he's got his lists lined up," Cashman said. "I guess that's a gray area. Thankfully, we're getting [Rodriguez] back, so if something makes sense that you run into, I think we'd gravitate to it. But it's hard to run into things that make sense, so we'd probably wind up going with what we've got." Bodies and blood were all over the desert freeway, and somehow Cody Ransom landed on his feet. He was standing upright inside a flipped 15-passenger van, death and dying all around him, and he had no idea how or why he was chosen to live. His feet had plunged through a shattered window and were planted firmly on the ground. The van belonging to the South Mountain Community College baseball team had blown its right rear tire on Interstate 10 in Arizona, crashed into a Palo Verde tree and rolled over two or three times on its catastrophic tumble from the fast lane to the other side. The limited surgery would probably sideline Rodriguez at least four weeks and may allow him to play most of the season. But he would still need a more involved procedure at a later time to fix what caused the tear. This limited surgery will sideline A-Rod for 6 to 9 weeks, meaning that he'll be back in April or May, as opposed to July or August, which would have been the case with the full surgery. After the season, he'll have the rest of the work done. Dr. Philiipon, the Vail, Colorado doctor who will perform the operation, said that he is 85-90 percent sure that A-Rod will not suffer a setback this season, following the initial surgery. Bryan Hoch reports that, on Friday, A-Rod went through more tests and worked out, gathering more information for an eventual decision on his next step. Though, it sounds like the possibility of surgery is becoming more and more real. "Alex is our future," Cashman said. "What's best for him is best for us. Ultimately, this is Alex's career. This is his life. I know one thing: he wants to do anything he can to help this team now." "If he was retiring after the year, this is a no-brainer," Girardi said. "That's not the case. I think you do have to take that into account, and it's a big part of the decision." Things have changed since yesterday. The Yankees said then that the plan was for Alex to try and play and have surgery after the season. Now both Hal Steinbrenner and Girardi have talked about Alex needing to make a decision about having surgery. Alex underwent more tests today and supposedly planned to throw and even hit in a cage out in Colorado. Then he will take a day or two to decide what to do, in consultation with the Yankees. The sense I get from talking to people both in Tampa and elsewhere is that Alex will be having the surgery and it would be as soon as Monday. The Yankees are fearful of his trying to play and then having to come out of the lineup. So, we're in wait and see mode right now. But, if it's bothering him as much as it sounds like it is, I say let's get it done. 03/07: Could Cano Move to Third? The Yankees have talked internally in the past about how Robinson Cano's best position might be third base in the long term. And it might be that if they determine A-Rod will be out for a long period of time, they could shift Cano from second to third and create another set of options for themselves as they try to replace A-Rod's offense. 03/06: If A-Rod Can't Go, What Are the Yankees Options? Bryan Hoch, Ben Kabak, Joel Sherman and Chad Jennings review some of the candidates that the Yankees could turn to, if A-Rod is unable to play. Cody Ransom is the name that jumps out as the internal candidate. Angel Berroa is another one. Externally, Mark Grudzielanek is a free agent and Scott Rolen, Melvin Mora, Chone Figgins, Blake DeWitt and others are mentioned as potential trade options. Yesterday, news broke that A-Rod would need surgery and would be out for 10 weeks. When the Yankees made their official comments, they said that the decision was rest and rehab, in hopes of him avoiding the surgery this season and staying on the field. According to Tyler Kepner, the reality is that A-Rod will have surgery at some point because this is not the type of thing that just heals. Brian Cashman told the media that the surgery would knock A-Rod out of the picture for four months. So, if he got it done today, he'd be back by July 6, at the earliest. Cashman said all last season that Jorge Posada’s torn labrum could be treated with rest and rehab. Then on July 30, as Posada underwent surgery, they made a surprise trade for Pudge Rodriguez. Meanwhile, the Kepner report mentions that the Yankees spotted an issue in A-Rod's hip last year, but decided not to invest it further. Cashman said the Yankees discovered an irregularity in Rodriguez’s hip last May when he underwent a magnetic resonance imaging exam for a right quadriceps injury. By June or July, the hitting coach Kevin Long said he could notice subtle changes in Rodriguez’s hitting, notably in his right foot — the back one in his stance. The foot was not pivoting fully, Long said, and as a result, Rodriguez could not completely turn his waist and clear his hips. This caused his bat to drag and prevented him from driving through the ball and generating maximum power. Ben Kabak discusses how the Yankees decision not to follow up on the MRI may now cost us dearly. After reading these articles, part of me says that he should just have the surgery now. It sounds like the hip will only get worse from this point. I think I'd rather be fairly certain of getting a healthy, rested A-Rod back by August 1, than I'd want to just play him and see how it goes and have him break down later in the year. Updating today's earlier report, Alex Rodriguez will not be having surgery (not right now, anyway), according to Peter Abraham, who spoke to Brian Cashman. They are going to try rest and rehab in hopes of keeping him on the field. That said, he's not going to play in the WBC. Update: No surgery for A-Rod. ESPN is reporting that Alex Rodriguez is going to have hip surgery and will be out for at least 10 weeks, according to his brother. The injury will keep the Yanks without their third baseman until at least the middle of May. It's a big blow, but I think the Yankees are still pretty solid without him. Peter Gammons suggested they might look to trade one of their pitching prospects for a solid starting 3B, but that might be a bit drastic. I agree that they probably don't want to go through two months of Cody Ransom at third base, but I don't think they need to do anything major. If the starting pitching turns out anywhere near as good as advertised, they could survive without A-Rod for six weeks of the regular season. Peter Abraham reports that Mariano Rivera will be making some throws from a mound tomorrow for the first time since his surgery. The plan, Abraham says, is for Mo to enter game action on March 17, which would allow him to get the time he needs before the season starts. Alex Rodriguez is experiencing some "tightness" and "stiffness" in his hip, thanks to a cyst. He'll be flying to Vail, Colorardo to be examined by Dr. Marc Phillipob, a hip specialist, on Wednesday. "We felt it was in everyone's best interest -- for the team and the player -- to send Alex to Dr. Phillipon, who is regarded as the leading expert in his field," general manager Brian Cashman said. "Alex has proven his durability throughout his career, and we will take every precaution and step necessary to ensure his health as we near the start of the 2009 regular season and beyond." At this stage, it is unclear as to if A-Rod will be able to participate in the WBC. I'm sure we'll know more on Wednesday or Thursday. Derek Jeter went 2 for 4 in Tuesday's game between the World Baseball Classic U.S. team and the Yankees, collecting a run and 2 RBI. Down 6-1 in the sixth, the Yankees rallied, but fell short, 6-5. Bryan Hoch at MLB.com writes about the WBC squad, including David Wright's kind words for the Captain. Ken Davidoff tabulated 2012 contract commitments for every team in the game and found that the Yankees have $91 million committed to four players. They are Alex Rodriguez ($29 million), CC Sabathia ($23 million, he could opt-out before the 2012 season, though), Mark Teixeira ($22.5 million) and A.J. Burnett ($16.5 million). This is the highest mark in the game by $41 million, with the Cubs coming in second at $50 million. The Red Sox are seventh with $30 million. Three teams, the Dodgers, A's and Nationals, have no commitments for that season. Interesting numbers to look at, but I should say that this doesn't necessarily concern me - Sabathia and Teixeira should both be playing at high levels and 2012 will be Burnett's final year, so that number comes off the books after that season. A-Rod's the big one, though, at this point. We'll see what he looks like as a 37 year old third baseman. Joel Sherman reports that the Yankees have finalized the contracts of the pre-arbitration players on their 40 man roster, signing Jonathan Albaladejo, Francisco Cervelli, Wilkin De La Rosa, Michael Dunn, Christian Garcia, Eric Hacker, Steven Jackson, Ian Kennedy, Cody Ransom and David Robertson. The next guest in our Interviewing the Yankees Blogosphere, 2008-2009 edition, is Chad Jennings, who authors the Scranton/Wilkes-Barre Yankees Blog for The Times-Tribune. During the offseason, my job covers a little bit of everything. Some features. A few columns. Filling in on high school and college events. In the past two months, I've written longer features about an NFL Hall of Famer and a Boxing Hall of Famer, and I've also covered high school swimming meets and a district diving championship. It's something different every day. About two years. Based on the overwhelming local interest, my newspaper asked me to start the blog when the Yankees came to town after the 2007 season. At the time, I had no interest in blogging. I thought it would take away from my newspaper coverage and I wasn't a huge blog reader at the time, but I've come to really enjoy it. I try to stay on top of the entire organization, and that tends to include information that has no place in the newspaper (my daily print readers probably don't care whether Damon Sublett is going to open in Trenton or Tampa) but the blog has been a great outlet for the random tidbits I pick up along the way. The worst part is that it's hard to unplug. On my days off, at least part of the day is always spent reading stories, checking fan blogs, refreshing Pete Abraham's blog, refreshing MLBTradeRumors.com, etc., etc., etc. If a story is out there, even if we have a stringer or someone else handling it for the newspaper, I want to get it on the blog as soon as possible. As far as worst things go, that one's pretty good. The best part is interaction with the readers. It's nice to get a feel for what readers are looking for, what information they consider important. I think I usually have a solid feel for which stories are worth writing, but instant feedback is a good thing. It never hurts. How did you end up at The Times-Tribune? I went to school at the University of Missouri. While I was there I wrote for the Columbia Missourian and my sports editor was a guy named Scott who used to work at the Times-Tribune. I graduated and was looking to move, and Scott knew the Times-Tribune was hiring. A month later, my car was loaded and I was driving 1,000 miles east into snow like I'd never seen. When did you decide that you wanted to be a sportswriter? I remember being 15 years old, writing a paper for school and enjoying it. That's when I decided I wanted to become a writer. I naturally moved toward sports writing due to a desire to never, ever cover a city council meeting or a car wreck. *Mayor Fiorello LaGuardia threw out the ceremonial first pitch at the Yanks home opener 11 times. Overall, New York City mayors have had the honor 31 times. Rudy Giuliani never did. (page 365). Chien-Ming Wang took an important step in his road back to the mound, making his first start since he went down last season with a foot injury. Five batters in the Houston lineup yesterday were players Wang faced the last time he pitched in a game. But there were no flashbacks, only a methodical two innings of pain-free work. "It felt good to pitch," Wang said. "It was the same as last year before I got hurt." 03/02: A-Rod Met with MLB on Sunday; Was "Cooperative"
A-Rod's meeting with MLB investigators took place on Sunday, as expected. They spoke for two hours and MLB released a statement saying that he was "cooperative." No other details were shared. Jorge Posada told the Post that his shoulder is "much better" and that he would now resume throwing. Meanwhile, both Jonathan Albaladejo and Jesus Montero left Sunday's game with what are hopefully minor injuries. Montero is suffering from a strained right groin and Albaladejo was pulled from the game after his left calf was hit with a ball. He said he felt fine, but there was no reason for them to leave him out there. Ken Davidoff of Newsday spoke to Yankees adviser Ray Negron, a long time member of the organization and someone who is close to George Steinbrenner, about his forthcoming children's book, "One Last Time: Good-Bye to Yankee Stadium," the third in a series. Negron expresses disappointment in Joe Torre, saying that a manager should never speak negative of his players. Publishers have offered Negron the opportunity to write a memoir, detailing his time with the Yankees and with Steinbrenner, but he as declined. MLB.com's Doug Miller reports that former Yankees pitcherTom Sturdivant has passed away, at the age of 78. He debuted with the team in 1955 and remained through the 1959 season, during which he was traded, long with Johnny Kucks and Jerry Lumpe, to the Athletics for Ralph Terry and Hector Lopez. As a member of the 1956 squad, he won a World Series, going 1-0 with a 2.79 ERA in two games. Our thoughts are with those who were close to him. MLBlogs' Mark Newman just responded to the Tweet I sent him this morning about the legitimacy of the CC_Sabathia account on Twitter. Originally, I had highlighted both the Nick Swisher and Sabathia accounts, but Newman had reported that it was fake, citing Sabathia's marketing rep. But, this morning, Paulie, a commenter at River Ave. Blues, pointed out that the Twitter account is linked on his official website. So, that's when I reached out to Newman to confirm, as well as a pair of beat writers. Newman was gracious enough to check again and confirm that the account is legitimate. So, that's good news. Follow away! The third annual Yankees Bloggers Fantasy Baseball link is drafting in a bit over a week, so I wanted to put a call out to other Yankees bloggers. If you regularly post to a blog dedicated to Yankees baseball and would like to participate in the league, please drop me at e-mail. It's a standard 5 by 5 league and it already features yours truly and Seamus from this blog, Andrew from Scott Proctor's Arm, Aziz from Pride of the Yankees, Greg from Sliding Into Home, Dan from Pinstripes, Pa. and Steve from The Yankees: Minors to Majors. I look forward to another fun season! Update: The account is real! Initially, I reported that Nick Swisher and CC Sabathia were both on Twitter. I had looked into their accounts, verified that Swisher's was official and saw that he was following Sabathia, that the same person did both of their official websites and it looked good enough to pass along. Yesterday, I updated that report to reflect that Mark Newman of MLBlogs had officially confirmed with CC Sabathia's marketing representative that the pitcher was not on Twitter. Now, Paulie a commenter on Mike's entry at River Ave. Blues, on this very same topic, pointed out that the Twitter account is linked on his official website. So, now, we're all confused. I've sent a Twitter message to Mr. Newman in an attempt to get double confirmation on it not actually being Sabathia's account. I'll report back if I hear back. Chad Jennings reports on Brett Gardner and Phil Coke being awarded with the Kevin Lawn Award as the team's top Minor League "Player of the Year" and "Pitcher of the Year." Jennings has a list of past winners in his article and it features some great players, including Derek Jeter, Don Mattingly and Chien-Ming Wang. Bryan Hoch and Kat O'Brien report that Jorge Posada is experiencing some shoulder soreness. "I played yesterday with it, and I could play today," Posada told Hoch. "It doesn't hurt me to throw, and it doesn't hurt me to hit. It's just sore." For now, it doesn't sound like it's a big deal, but the Yankees are, understandably, playing it safe and keeping him out.